Nationality in IndyCar is a tricky thing. As much as we've adopted guys like Tony Kanaan or Helio Castroneves as our own, there remains a sensitivity towards national origin a scant year after we saw a record-low number of Americans full-time in the series. We have plenty of great, likable international drivers IndyCar, but there's also not a thing wrong with wanting to cheer for the Red, White, and Blue now and again. There's definitely been a concern not enough Americans were finding a path into American open wheel racing. Happily, right now the Mazda Road to Indy is looking like a ladder series that's filling up with top American prospects that just might be taking the green at the Indy 500 one day. New Year, New Champ, Newgarden? We've heard of Bryan Clauson as the USAC champ getting the opportunity to race the ovals in Firestone Indy Lights this year. Indy Lights has two other key American prospects in Josef Newgarden and Conor Daly, who finished 1-2 at St. Pete in the season opener. Daly was the beneficiary of a Road to Indy scholarship for being Star Mazda champ, which is a great illustration of the ladder in progress. Daly also has business in Europe, but it sounds like he's open to a career stateside as well. Logan Gomez is still searching to put something together this year, so don't count him out, either. Just below Indy Lights, we have the Star Mazda Championship. This series is packed with a number of truly talented young American drivers. Connor De Philipi took the checkered at St. Pete, and just might be the man to beat this year after giving Conor Daly all he could handle the year before. Chris Miller, Nick Mancuso, Nick Andries, and 2010 USF2000 champ Sage Karam are other American hot shoes to keep an eye on. These drivers all have different situations, but are all exciting to watch in action. The Star Mazda field is extremely deep this year, and quite a few of those legitimate challengers are home-grown talent. In the USF2000 ranks, Spencer Pigot and Zach Veach might be two of the better-known young American drivers, but they're no means alone. Blogosphere and online fave Shannon McIntosh is making the transition from USAC, and her blogs on the topic make for fascinating reading. Below USF2000, you have Skip Barber and a myriad of karting organizations. The next great American prospect could there right now, waiting. The 2025 Indy 500 champ could be just cutting his teeth at the entry levels of racing. That's one of the things that makes series such as USF2000, Star Mazda, and Firestone Indy Lights fun to follow--you know only a select few will make that jump, but there's a satisfaction in watching a driver develop and mature over the years. So there you have it: there are plenty of young American driving prospects out there to cheer on, and tons of poweful international talent to challenge them at every turn. Like most IndyCar fans, I want the best drivers in the world in the IZOD IndyCar Series. But I also want a clear opportunity and path for young American drivers to be able to compete and prove themselves. The Mazda Road to Indy is still a young project and there's work to do, but the talent is there, and the scholarships to move up are, too. We'll see who wins the scholarships, who makes the jump, and who's going to be an All-American star in IndyCar. 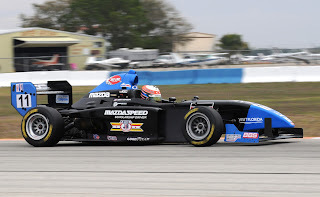 As this past weekend showed, the 2011 Star Mazda field is stacked with talent. 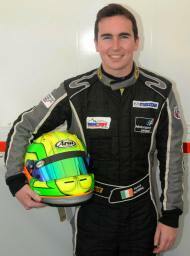 Of that talent, one of the newcomers is Irish racer Patrick McKenna. 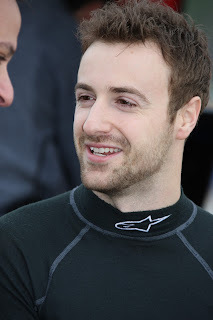 He’s a 23 year-old rookie who finished as runner-up in USF2000 last year, managing a pair of victories along the way. He finished 4th in his Star Mazda debut for Team GDT at St. Petersburg. Before St. Pete, however, Patrick took some time to answer Six Quick Questions, where he talks about moving up through the ranks of the Mazda Road to Indy, the racing scene in Ireland, and much more! Patrick, thanks for the opportunity to chat with you. You're coming from USF2000 to the next rung in the Mazda Road to Indy in Star Mazda. From a driver's standpoint, how much of a transition is it to this new platform? PM: From my own prospective the move from a USF2000 car to a Star Mazda has been a pretty natural transition. When Dan Andersen gave me the opportunity to test one of his Star Mazda cars for coming 2nd in USF2000 last season, I felt at home straight away in the Mazda. Its certainly not too big of a step but just a progression in terms of horsepower and Mechanical and Aero grip. The Star Mazda is a very nice car to drive in terms of the power to grip ratio. How did you end up racing in America? What's been your career progression up to this point? PM: My decision to race in the US was based mainly on the announcement of the Road to Indy ladder at the end of 2009. Also my friend Peter Dempsey who had a lot of success in his time in Star Mazda had sold me on the benifits of racing this side of the Atlantic. With Mazda's support of the open wheel ladder in North America I felt the US was the best place for me to try and progress my career and the rejuvenation of the USF2000 series in 2010 was the right move for me at the time. I have not looked back since. Previous to 2010 my career started in Karting from 1999 through 2006 in Ireland and the UK. I then competed in FF1600 in Ireland and the major races in the UK in 2007 and 2008 before competing in the British Formula Ford National Championship in 2009. We hear now and gain about the Irish racing scene with such drivers as Adam Carroll in IndyCar last year, as well as Lights driver Niall Quinn. How are the racing opportunities for drivers over there right now? PM: The Formula car racing scene in Ireland has suffered a bit of a recession in recent times and the grid numbers are not what they used to be. Rallying is certainly the most popular form of motorsport in Ireland. However, the governing body Motorsport Ireland do a great job in trying to help out young drivers who want to progress there career and race internationally. I have been fortunate to recieve scholarships associated with winning the Dunlop Motorpsort Ireland Young Racing Driver of the Year award for the past two years. This has been a big help in getting me to this stage of my career and I am extremely grateful for their support. You showed some definite speed at the test at Barber in mid-March. What sort of goals have you set for yourself as far as performance this year? PM: Yes, the Barber tests were positive for us considering we had done a lot less testing than some of our competitors. The team have given me a great opportunity, We have gelled from the start and I feel we can definitely be competitive throughout the season. For sure there are a lot of very quick drivers in Star Mazda this year as well as a lot of good teams. I have no doubt that it will be a very competitive season but the goal would be to start off with some strong results and build from that as the season goes on. What's a weird racing quirk or superstition you have? PM: I have tried to get rid of superstitions throughout my years of racing but I guess its something very common among drivers. One I had from my time karting was never to think of any possible post race celebrations before you've actually raced!! Or as the saying goes, "don't count your chickens before they've hatched". Do you feel the Mazda Road to Indy is a viable ladder to take you to the top of American Open Wheel racing? PM: I think the announcement of the Mazda Road to Indy this year was certainly another big step in the right direction for open wheel racing. It's a well-structered and supported ladder system unrivalled anywhere else in the world. The scholarship for the Lights winner to IndyCar is also another big benifit of the ladder and further proves Mazda and INDYCAR's intentions of helping young drivers progress to IndyCar. However, as we know it costs a lot of money run at the top levels of racing and drivers still need to take budget with them before they get established. It's the nature of racing these days, but hopefully it will continue to change for the better and there will be more opportunities for up and coming drivers in open wheel racing. There were Civil War battles with less attrition than this race. Demolition derbies have been conducted at the Hamilton County Fairgrounds with less car damage. Entires seasons of Survivor had less elimination. 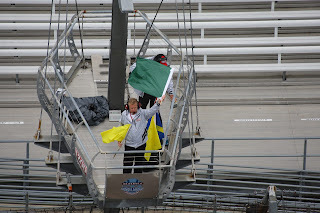 OK, so it wasn't quite that bad, but it was a bloody start to the 2011 IZOD IndyCar Series, with multiple Penske and Ganassi cars being knocked out of contention early. Things did settle down after the crazy start. Dario Franchitti ran out in front, chased by a mix of Will Power, Tony Kanaan, and yes, Simona de Silvestro throughout much of the race. Long after Franchitti had showed himself the class of the field, with Power chasing after, TK and Simona gave us an awesome battle for 3rd place, with TK in his new KV Racing gig holding her off for the podium. Still Standing After The Carnage! It was still the best finish ever for de Silvestro, who continues to impress (and even trended on Twitter, along with Dario yesterday!). And although the early incidents turned the day upside down, there's no denying Franchitti and Power will likely be battling all year long, Tony Kanaan is an important, relevant, and key driver for this series, and the Swiss Miss is going to be a star...as soon as they figure out how to market her. Mazda Road to Indy: It was an All-American weekend across the ladder series. In Indy Lights, Josef Newgarden won in his first Indy Lights outing, while Conor Daly rallied for second place. The fight among the first 6-7 positions this year in Lights should be pretty intense. 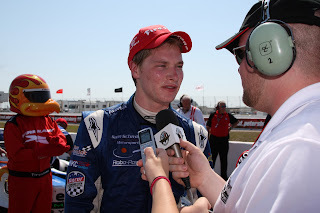 In Star Mazda, Daly's old rival Conor DePhilipi started 2011 the same way he finished 2010--with a victory. (Congrats to Chris Miller and Chris Miller on their respective 5th and 7th-place finishes--we have recently done interviews with both!). In USF2000, Spencer Pigot grabbed the pole and won in only his third series start. A Rough Start: EJ Viso crashed in the first three practice sessions of the year, survived qualifying, and then spun it in the race. Not a good omen for KV Racing, who was hoping to avoid the errors Viso had shown last year. He recovered enough to finish 19th, 6 laps down. Bad news also followed Dale Coyne Racing, with Sebastien Bourdais wrecking twice and being unable to start due to extensive car damage. James Jakes also had severe car damage, but Coyne's team was able to have him start the race. Sebstian Saavedra totaled a car in qualifying for Conquest Racing after being the fastest rookie most of the weekend. I can only imagine how disappointing that sort of season start is. Seriously, A ROUGH Start: An incident right at the start took out Marco Andretti, and smashed up the cars of Scott Dixon, Mike Conway, Ryan Briscoe, and Helio Castroneves pretty well. We saw 4 cautions in the first 14 laps. Not a single Andretti car remained unscathed, with Danica Patrick and Ryan-Hunter Reay limping home after damage. Mike Conway's comeback will need to wait at least one more week; he finished 23rd due to the first-lap incident. Two-Wide Tantrums: Expect plenty--and I mean PLENTY--of argument over the two-wide starts and restarts this week. Look, what happened on the initial two-wide restart was the product of one or more drivers losing all common sense for a couple of seconds. We don't need to drop the Two-Wides; they aren't the issue. The drivers need to be taken to the Principal's office one more time and reminded to NOT SPAZZ OUT. Injury Report: Ana Beatriz injured her wrist, potentially badly enough to be kept out of the next race. Teammate Justin Wilson also injured his wrist, but it sounds like he should be good to go for Barber. We'll have to see who might get the call for Barber if Bia can't go.We'll know more after they have some tests back in Indy. Rookie Report: JR Hildebrand had a rough weekend before the race, but stayed largely out of trouble during it. He paced all rookies with an 11th-place finish (gaining a spot after Danica was penalized for "avoidable contact"). Saavedra (backup car and all) moved up to finish 2 laps down in 13th . Bia finished 14th, and Jakes 15th (with a pretty good run up until the midway point). Charlie Kimball tagged the wall to drop out and finish 22nd. The last was especially shame, as Kimball had quietly been putting together a solid outing. Top 10 Who? : What a diverse and varied Top 10 this was. Besides your Top 4 mentioned above, 5th went to KV's Takuma Sato, who showed, yes, perhaps he can keep it all together. 6th went to Alex Tagliani, who made a strong initial showing for Sam Schmidt Motorsports. 7th went to Rafa Matos, 8th to Vitor Meira. Oriol Servia earned Newman/Haas 9th after a couple of early issues. Justin Wilson recovered from a late spin to finish a marginally disappointing 10th. Simona was part of a diverse Top 10. An "A" For AFS: With an IndyCar team less than a month old, AFS Racing had an excellent day, finishing an extremely consistent 7th. We'll have to see what their plans are for Barber, but Rafa Matos really did the most with his second chance in this series yesterday. It's a good story that probably won't get as much press as it deserves. Plowey Driving? : Martin Plowman raised a lot of eyebrows when he was seen walking around with firesuit and helmet. Was it a last-minute ride? As it turned out, he was driving the two-seater. Plowey's still looking for that ride this year--single-seater variety, if you please. Timing/Scoring: Yes, IndyCar Race Control had major issues this week, with intermittent radio for quals and practice, and timing and scoring that was spotty at best. Fans were frustrated, and rumor is Randy Bernard is hot under the collar to get the issues fixed ASAP. Let's see what we get in two weeks. Not-So-Fun Fact: Marco Andretti has not made it off the first lap two season openers in a row. Last year ended with Mario Moraes' car on top of this; this one ended with him upside down. Maybe he should just skip to the second race on the schedule. Next Up: The next stop is Barber Motorsports Park, for the Grand Prix of Alabama. We'll see if some of the big names of the series can make up for missed points opportunities in the St. Pete opener, and if some of the surprising names up front can keep it coming. The winter lasted forever, didn't it? But here we are, happily in springtime, and anxiously awaiting this weekend's season opener of the IZOD IndyCar Series. They'll take to the Streets of St. Petersburg, where last year Will Power continued his dominance on the twisties with a tremendous winning performance. 2010 series champ Dario Franchitti begins his title defense, and the Penske and Ganassi drivers must face the deepest field this series has seen in years. Justin Wilson, Graham Rahal, Sebastien Bourdais, Tony Kanaan, Ryan-Hunter-Reay, Mike Conway, Simona de Silvestro, Marco Andretti, Oriol Servia, and a host of other drivers should be bringing plenty of heat to the competition this year. The engines are ready to scream to life, the teams eager to show what they worked on through the hard winter, the fans can't conceivably wait one more minute, and the flag is ready to drop. Welcome to 2011 IndyCar--it's going to rock. Line 'Em Up: OK, so there's no "lucky dog". But we will have double-file restarts and wave-arounds for cars between the lead car and pace car. We'll see what the double-files do for competition, but it should be pretty wild seeing the results for the first time. Rookie Time: Five “official” rookies will take the green at St. Pete: JR Hildebrand, Charlie Kimball, James Jakes, Ana Beatriz, and Sebastian Saavedra. You don’t want to judge a season on a single race, but it might give us some insight into who’s the early favorite for Rookie of the Year. Rivalry! : Tony Kanaan and Marco Andretti may have some tension between TK’s departure from the team and Marco’s pretty blunt talk in his Racer blog. It'll be interesting if they're close together on the track at some point. It's the sort of actual grudge match that I'm sure the networks and series would love (and honestly, need) to see develop. KV Racing Returns: Speaking of Tony Kanaan, he leads a three-car KV Racing effort back onto the track. KV absolutely, positively, must eliminate the numerous errors and crashes that gave them the worst IndyCar season in recent memory. Do they have the speed they believe they do? Can those flashes of excellent turn into sustained success? Watch Takuma Sato, EJ Viso, and Tony Kanaan to gauge where this team is compared to last year’s woeful start. Welcome Back, Mike! : Mike Conway suffered the sort of crash at Indy that none of us watching will ever forget. 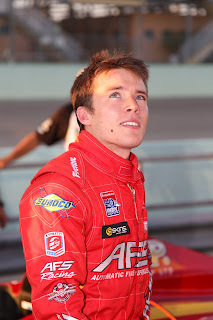 Who at that terrible moment thought he'd be back in 2011, let alone with Andretti Autosport? Conway's recovery and performance in the #27 car is going to be a focal point for well-wishers and critics alike. Sophomore Simona: The abrupt loss of their race engineer will hurt this team, but Simona de Silvestro and HVM Racing have seen themselves thrust into the limelight by the popularity and potential of the Swiss Miss. Can they respond with a stellar year? We're about to find out. AFS Arrives: AFS Racing will be making their IndyCar debut with Rafa Matos in the driver's seat. How competitive will they be? Is this a one-shot for Rafa, or is there more in store? AFS was excellent in Lights; now we get to see how they do in the big cars. Winner: Power. Until he doesn't, he is. Simple as that. Don’t Touch That Dial: During the weekend or immediately afterwards, we could hear an announcement regarding Dan Wheldon’s season plans, as well as those of teams such as Conquest (2nd car) and AFS Racing. Silly Season isn’t over yet; and you can expect a pretty good stream of announcements just around the corner. Let’s go racing! It is time, friends, for the IZOD IndyCar Series. Enjoy every minute of it. Check back here Monday after the race for a full recap and discussion. IndyCar Drivers: So Who’s Left? Note: Stay tuned for tomorrow’s Streets of St. Petersburg preview! Make sure to subscribe to IndyCar Advocate (or make us a regular internet stop), because we’re going to have you covered all season long. The always-volatile IndyCar offseason has settled down after one last giant eruption this week. Tony Kanaan got his ride with KV Racing. Paul Tracy’s in with Dreyer & Reinbold for Indy and probably several other key races besides. The merry-go-round at Coyne and Conquest has settled, with Sebas Bourdais and James Jakes in for DCR, and Sebastian Saavedra as Conquest’s only driver at the moment. Rafa Matos squeezed in for at least one race with AFS Racing, a late entrant to the 2011 grid. No one’s sure what happens after St. Pete with AFS; perhaps Matos gets more races, or perhaps they go in another direction. So who’s still out there? It might help for a moment to put the seats we still know of into focus. Conquest Racing has indicated they may have another car on the grid as early as the Grand Prix of Alabama (you may recall they did something similar last year, starting three races in with Bertrand Baguette). Dale Coyne still has a seat open for the oval races Sebastian Bourdais won’t be running. Panther Racing could have a second car on several of the ovals. The chances of Dragon Racing doing anything this year seem to have greatly diminished, with several individuals from DeFerran Dragon having already signed with other teams. Martin Plowman has indicated he’s still trying to get a deal done by Indy. Plowey tested with Coyne in the offseason, and while that’s still the most likely projected seat for him, it should be interesting to see if any other opportunities pop up. Alex Lloyd doesn’t sound like he’s got much money, but he’s still in the discussion for Dale Coyne Racing. Given his past performance, if nothing else, it’s quite possible he finds a seat for the Centennial 500. In the meantime, he’s pulling duty as a driving coach in Indy Lights. Yes, Milka Duno could return for the ovals with Coyne. We will see. Pippa Mann, like Plowey, is hoping to put together an oval program in time for Indy. She’s tested with Conquest, but I would watch around the time of Barber to see if Conquest announces anything else for that second car. The type of program announced might give us a good idea if Pippa’s odds at Conquest are looking up. Dan Wheldon still has no ride, and it sounds like he’s turned down several opportunities. There’s any number of team Wheldon might end up with as a partial schedule; for now, he’s apparently comfortable to bide his time, waiting for the right deal. We should know more after St. Pete. Tomas Scheckter is still out there, but it looks like this season will be the same as many seasons for TScheck: a decent ride at Indy while subbing at a few more races here and there. Tomas is exciting to watch on the track, but those moments will likely be scattered through the schedule. Bertrand Baguette impressed in what began as essentially a zero-expectations role with Conquest for 2010, but so far the Belgian has been able to get a deal together to return to countryman Eric Bachelart’s team. Right now, it sounds like he’s working on something for Indy, but he could be a late starter, not unlike last year’s campaign. Last, but certainly not least, there is the question of James Hinchcliffe. Is there anything else this rookie needs to do to prove he needs to be in the IZOD IndyCar Series? He’s outgoing, charismatic, and drove the wheels off the car at the Barber test. He’s won in Indy Lights, narrowly missing a title in the same. Newman/Haas wants him in the car. The fans want him in the car. I’m fairly certain the series wouldn’t mind it, either. But, as we all know, the sponsors need to want it, and that’s still a work in progress. 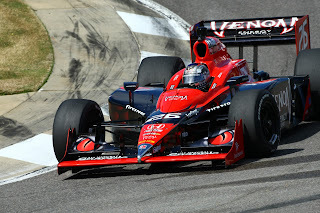 Hinch paired with Oriol Servia could give Newman/Haas a great 1-2 punch as they aim for a renaissance in 2011. Let’s hope a sponsor steps up and in the process gains an excellent spokesperson for their product. In any case, while we get ready to enjoy one of the deepest, most talented fields top to bottom in years, there are still drivers out there, fighting to make the dream happen. Whether they join us by Indy or Las Vegas remains one of the big question marks of the young year. With the Streets of St. Petersburg and the opening of the IZOD IndyCar Series only a couple of days away, you'll want to refresh yourself on the teams, the drivers, and the forecast for both in 2011. We've got you covered, with a team-by-team breakdown for the entire IndyCar series. Some teams have a bright future, whereas others face continuing challenges. Still others seem like a total question mark. 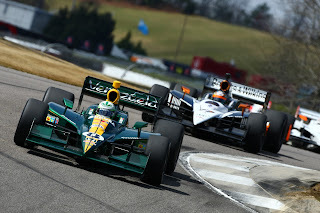 Read on to see how things are shaping up for your favorite IndyCar team in 2011. It looks like AFS will answer the bell for 2011, though exactly whom will be the driver after the Streets of St. Petersburg is still very much in question. We'll have to see exactly what their growing pains are, but don't expect this team to be a frontrunner on Day 1. Rafa Matos had a difficult offseason, losing his father and his ride at DeFerran Dragon Racing within 24 hours of each other. He's getting at least one more chance to show what he can do, but expectations should be managed with this program. AFS was successful in Firestone Indy Lights; can they find the same magic in the big cars? 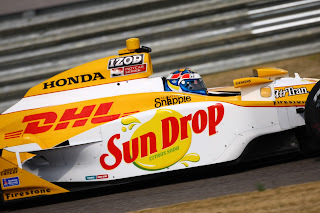 After a tumultuous offseason (Tony Kanaan leaving, some sponsorship reductions), Andretti recovered in part with the surprise signing of Mike Conway and the addition of DHL as a major sponsor. This team is all about the expectations: will Danica return to form in what might be her last year full-time in an IndyCar? Can Marco Andretti finally break his winless streak and begin to turn some of those near-misses into trips to Victory Lane? How will Conway return from his grisly accident at Indy last May? Ryan Hunter-Reay should be a solid, productive presence on the team, and should be a threat to win at least once. John Andretti (#43) will return for the Indy 500 once more. Marco's been continually close at Indy, but hasn't sealed the deal the last few years. Look out for Patrick at Texas and Indy especially. Conway seemed to really be picking things up before last year's accident, and how he bounces back should be one of the best storylines of the season, especially when he returns to the 500. Any of their 4 main drivers are potentially Top 5 finishers there; we'll have to see if any of them can bring home the checkered flag. This team won two races last year. Anything not surpassing that will be regarded as a disappointment. Ganssi actually split his operation up between his usual team and newcomers Charlie Kimball and Graham Rahal, but for our purposes, we're putting them all together. 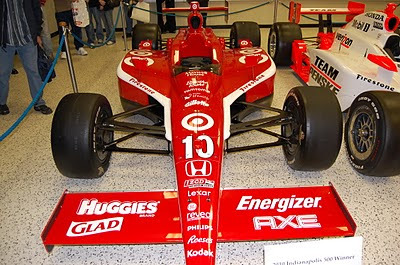 Dario Franchitti is a favorite to defend his IZOD IndyCar Series Championship, but this is Ganassi, so you know Scott Dixon will be right there as well. Graham Rahal's Service Central sponsorship grabbed him a spot with Ganassi's spinoff team, and it'll be both a chance and a test for the legacy driver's talent to be given a chance to show what he can really do. Charlie Kimball will need to do some on-the-job learning, but has a definite shot at Rookie of the Year if he can put it all together early on. Franchitti, Dixon, and occasionally Rahal should duke it out with Penske for ultimate bragging right in the 2011 campaign. Sebastian Saavedra will be Conquest's main driver for 2011, but a lot of fans aren't exactly up on the young Colombian after his very public walkout and impolitic comments regarding Bryan Herta Autosport at Kentucky in Firestone Indy Lights last year. Saavedra's a rookie everywhere but at Indy, but the general consenus is he does have some speed. We'll see if it's enough to have him be a Rookie of the Year candidate and occasionally push Conquest out of the backmarker ranks. The second Conquest car (#36) is still very much up in the air; it sounds as if team owner Eric Bachelart is trying to put together a deal starting a couple races into the season. No one seems sure if Bertrand Baguette could return here for some events, though he is trying to find a deal at least for Indy. Pippa Mann could quite possibly see a partial oval schedule here, or it could be a complete unknown currently off the radar. And therein lies the joy of trying to do a preseason preview for a mercurial team such as Conquest. If you thought trying to write a preseason analysis for Conquest was bad, attempting to do so for DCR will give you nightmares. Coyne instantly made his team relevant on road courses by signing Sebas Bourdais to a twisties-only schedule for the #18. The four-time ChampCar champion should be an absolute blast to watch. A couple of names remain linked to this car for the ovals, most notably Alex Lloyd and Lights driver Martin Plowman. James Jakes tested with Coyne at Barber in the #19 car, in the sort of surprise move that really isn't a surprise when it's Dale Coyne Racing. He's looking full-time for DCR as well, but he's perhaps the least-known quantity out there. This might end up being the most bipolar (but fascinating!) team to watch develop on the entire grid. If Plowey or Lloyd get some time in the car, they should be interesting to watch, but otherwise this team's going to suffer on anything oval-shaped. Veteran Justin Wilson is in his second year with this team, and is one of the more highly regarded technical drivers in the series. He's more than capable of winning, especially on road courses; we'll have to see now if he can take Dreyer and Reinbold to the upper tier of IndyCar teams. His teammate this year, rookie Ana "Bia" Beatriz, has previously impressed fans in Indy Lights and karting, but she'll have to show more than she showed at the Barber test if she's to compete for Rookie of the Year honors. Don't be surprised if you see a few races in a third car by a driver or two at Indy or later on. Paul Tracy is confirmed for at least the 500. Veteran Davey Hamilton also seems to be linked here with Kingdom Racing and his partial-season oval program. Meira currently has the longest active IndyCar streak for starts without a victory. He's been close many times, but it's just never happened. Foyt will likely be tempted to field a second car for the Centennial 500, which also marks 50 years since his first 500 victory. Super Tex's team has an uphill battle if they're going to visit Victory Lane last year, but it won't be for lack of effort. Expect Meira to give it everything he's got, and then some. 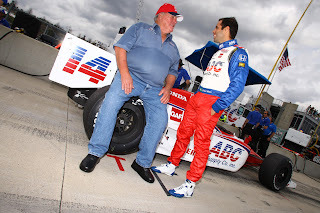 It would be only fitting that Foyt managed to win the Centennial 500 as a team owner. It doesn't seem overly likely, but don't count this team out quite yet. If this the #14 car plugs along in 12th or 13th place in the standings all year, it'll have to be considered a disappointing year. A Top 10 points finish is not totally out of the question, but it'll be a fight--they'll have to improve upon the six Top 10 finishes from last year to have a shot at it. Simona charmed many fans last year as a rookie with her enthusiastic, cheery personality and a clear love of racing. Big things are expected of Sim and the HVM crew on the road courses; let's hope that a brand-new tub to replace the dinosaur that labored through the last portion of 2010 help fulfill those expectations. (A solid sponsorship doesn't hurt, either). Losing their race engineer late in the game to KV Racing won't help this team any, however, and we'll have to wait and see how they respond to the shake-up. On the PR side, with Danica Patrick possibly on her way out the door to NASCAR in 2012, look to see if INDYCAR makes any moves to help promote Simona to their overall audience. 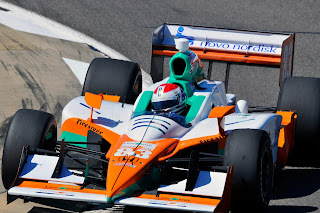 It's hard to think of a more nightmarish season than KV Racing endured in 2010; it seemed like Mario Moraes, Takuma Sato, and EJ Viso were hitting the wall at every turn. By sheer force of odds alone, one would think KV could not have another season like that this year, and for their sake, let's hope that's the case. The frustrating aspect of it all is that KV showed some very fast cars at times last year, with returning drivers Sato and Viso also capable of serious challenges in maddenly inconsistent bursts. Viso in particular continues to show great promise between incidents, but he really needs to find some consistently in his 4th year in the series. Viso and company look to put the past behind them. Tony Kanaan was a late addition to this team after his DeFerran Dragon Racing deal (and the team itself) dissolved late in the offseason. Kanaan showed last year he can still win, and he's still one of the most talented, popular drivers in the series. If this team can reduce the mix of errors and bad luck, they could grab the checkered flag at some point in 2011. The cars are speedy enough; the decisions and luck need to be better. Also, don't forget, Tomas Scheckter (likely) and Redline Energy/SH Racing should partner with this team for Indy. Oriol Servia tested early and often with this team, but wasn't officially signed until very late in the game. Newman/Haas underachieved with Hideki Mutoh in the cockpit for 2010, but Servia is a smart, experienced driver who will bring the car home and should do the absolute most with what he's given. James Hinchcliffe set the world on fire with his test at Barber, but still needs to have funding come through for a full season. Newman/Haas has struggled in the past couple of years off and on, but don't let that fool you: this team absolutely can contend. They shouldn't be off anyone's radar for very long. J.R. Hildebrand is a rookie, but a highly regarded one. He's replacing a popular former champion in Dan Wheldon, so you can imagine all eyes are going to be on Hildebrand to see if he can fill those (designer) shoes. Panther's test at Barber ended early with a mishap, but Hildebrand should compete with Ganassi's Charlie Kimball for Rookie of the Year honors. Panther should remain dangerous at Indy and the other ovals, but it will be interesting to see how their road course results stack up the mediocre results of years past. Watch to see if Hildebrand is capable of minimizing his growing pains, and look for Panther to add a second car at Indy and perhaps a couple of the ovals. It's good to be Penske. Let's get this straight; Roger Penske is possibly the most efficient, successful person on the face of the Earth. Except that Chip Ganassi has beat him for the IndyCar championship the past two years, and also won last year's Indy 500. The Ganassi/Penske rivalry should be nothing short of brutally epic this year, but don't expect Penske to accept failure. Helio Castroneves will look once again for that elusive series championship (not to mention 4th Indy 500 victory! ), but he's going to have to somehow outdo teammate Will Power, who dominated the road courses last year in a manner rarely seen. Team Penske found the sponsorship to keep Ryan Briscoe on board, but after a somewhat down 2010 season, he'll need to pick it up this year to keep pace with his teammates. Along with Ganassi, this team will represent the top tier of the sport in 2011. The finances behind FAZZT Race Team had always been questioned, but there's little doubt of the talent of Alex Tagliani and the crew assembled there. Sam Schmidt bought up the troubled team's assets, which should mean more financial stability overall. This team isn't currently at the level of a Penske or Ganassi, but perhaps of all the smaller teams, they're the ones most capable of giving them plenty of headaches. Watch for Tag to challenge those perennial frontrunners at multiple points this season. If they can up the consistency of their good outings, look out. Townsend Bell is confirmed for Indy and Vegas, but we'll have to see if he runs any races in between those two. This team will also be running Wade Cunningham for few races, and Jay Howard (in partnership with Rahal-Letterman-Lanigan) at Indy. It's great to see Cunningham finally get his shot; for Howard, this may be his best chance yet to qualify for that elusive spot in the Indy 500. Hometown favorite Ed Carpenter is running all the domestic ovals and likely three road courses as part of SFR's partial season. Fisher's results were generally poor last year and often attributed to a defective tub. We'll have to see if Carpenter can bring some of his oval magic to this team, or if he'll be stuck near the back. With Fisher herself retired from active driving and settling into a full-time role as owner-only, it will be interesting to see how the dynamic and results of this team respond. Depending on how things go, SFR could field a second car for Indy, but you have to think they'd be pretty careful after failing to make it in on Bump Day with Jay Howard last year. Dan Wheldon has seemed confident of a ride, but the money right now is on him being Indy-only. If Dragon Racing emerges at this late date from the ashes of De Ferran Dragon, he could go there, as well as the possibility of later races with AFS or another team. We also could see Indy Lights driver Brandon Wagner find a seat later in the year, and "Speedy" Dan Clarke has been brought forth as a possibility as well. So long as we remember that silly season doesn't strictly end when the green flag drops for the first time, nothing that happens should be a total shock. Of course, there's all the five drivers who will be invited for the Vegas Challenge, but we'll just have to wait and see on that, though I can't think of a better way to end the silly season than with having Alex Zanardi confirmed for that race. Let's hope it happens. 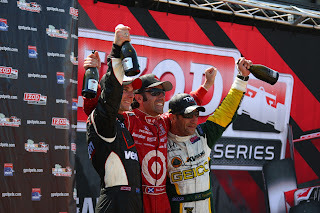 (Images courtesy of IndyCar Media). 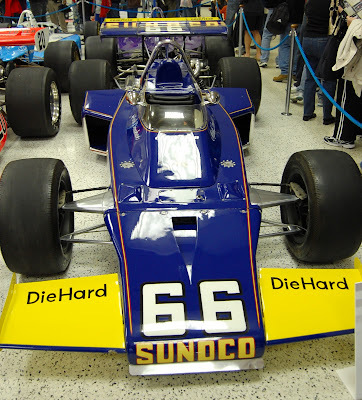 This past Sunday was a special day in Speedway, as the Indianapolis Speedway Museum officially opened it's Centennial display of Indianapolis 500-winning cars. 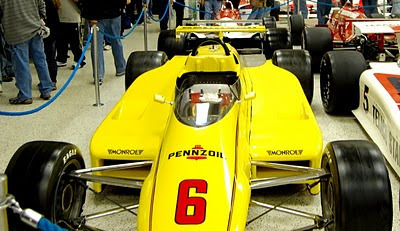 Not all of the cars that will be on display had arrived, but it was more than enough to be the single-greatest display of IndyCars I have ever seen. 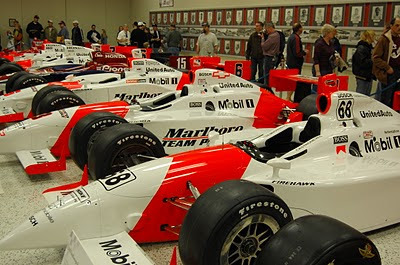 The contributions from IMS, private collectors, and Roger Penske's collection were nothing short of tremendous. Legends such as Rick Mears, Bobby Unser, Al Unser, Jr., and others were on hand for autographs. The place was swarming with people, and was as full as I've ever seen the place. Getting to see Rick Mears' '84 winner was special for me. 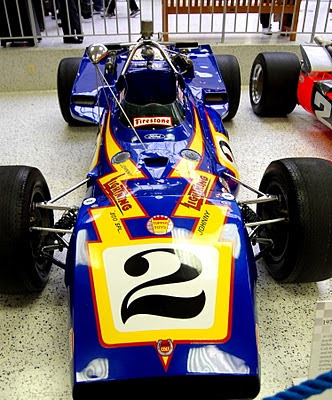 It was my favorite car growing up, and I think it remains one of the best-looking IndyCars of all time. 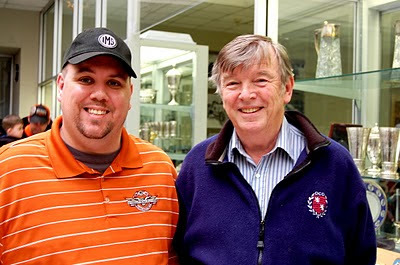 I got to chat with IMS historian Donald Davidson briefly, and have my photo taken with him. I can't think of a better end to the day. The IZOD IndyCar Series kicks off this week , but we don't want to forget it's also the opening week for Firestone Indy Lights and the Star Mazda Championship presented by Goodyear. While our favorite top open wheel series is firing up, the top prospects and champions of tomorrow are doing the same in the immediate lower rungs of the Mazda Road to Indy. INDYCAR Nation members can check out my article on Star Mazda (free to register, if you haven't already! ), but in the meantime, here's the latest edition of Six Quick Questions. We interviewed Star Mazda Nick Mancuso, an American driving prospect who looks to make an impact in the series this year as a transfer from the sports car ranks. He was impressive at last week's spring training at Barber Motorsports Park, and should be fun to watch as he contests the 2011 campaign with two-time Star Mazda champions JDC Motorsports. You'll want to read about his transition to the open wheel ranks, as well as his...unique off-the-track pursuits! Thanks for your time, Nick. You're joining a team in JDC Motorsports that's a two-time series champion. How did this deal come about, and what do you project as your goals for this campaign? NM: No problem, I love talking about myself!! JDC Motorsports is a top notch operation with the winning record to prove it and I feel very lucky to be with them. I have been bugging John Church for years to put me in a car and during this off-season I was given a chance by the INDECK Group of Companies to do a test. After some encouraging testing results we decided to start the year off with a partial season and see how it goes. I think I have to be realistic with my goals this year. Being a racecar driver I am inherently self-confident, but I also realize that I barely have any seat time in these cars and I am really jumping in to the deep end of a very talented Star Mazda grid. On the other hand this is the big break that all drivers dream of so I want to make the best of it! If I could challenge for a top-5 finish after a few races and get on the podium by the end of the year I would pat myself on the back. You just finished testing at Barber Motorsports Park. How did you feel the test went, and what sort of feedback do teams look for from these tests? NM: The test was great. It was also a bit frustrating as I was typically just barely inside the top ten and sometimes outside of it. Every additional lap I do in one of these cars I learn something and improve. I believe my fastest lap was one of my last laps in every session while some of the other drivers peaked a bit earlier, so I hope to sneak up on people as the race weekends progress. Even I was a bit surprised when I was P3 in the wet during the second day, but I still need to build up my confidence with the car in the dry. All of the JDC cars rolled out of the truck with a pretty good setup but we had very long sessions so we used them to our advantage to make many changes to the cars and see how they reacted. As I am so new to the cars I typically try to leave the car as is for the initial runs until I can really feel what is going on and what I need to go faster. The team looks for feedback on how the changes affected the balance of the car and how it changes throughout the run. It was interesting to see how reactive the car was to the IndyCar rubber on the track and the changes in ambient temperature. This is all great knowledge to pull from when we come back to Barber in a few weeks. There's definitely a slew of young talent in Star Mazda this year. Where do you feel the odds lie right now for young drivers wanting to move up the ladder of the Mazda Road To Indy? NM: Yes, I am very surprised at just how quick these Star Mazda drivers are. Especially my teammate Tristian Vautier, he is one fast Frenchman! It's truly incredible what Mazda is able to do in motorsports given the size of the company and the Mazda Road to Indy reflects their commitment to helping young drivers. If you are a driver out there looking to "make it" in open wheel racing there is nothing better that you can do than aligning yourself with the Mazda Road to Indy. Whether it is at the karting level or you are jumping into the middle of the ladder like I am, just being part of the system is a really unique opportunity. You're coming over from a sports car background. Why the change, and what challenges does the transition offer? NM: My racing background is a bit varied as I have never run the same series twice in a row. The Star Mazda car is definitely a big change as I am used to driving something that is three times heavier! I love sports cars and would definitely like the opportunity to run at Sebring, Daytona, LeMans, etc, but there is also a limited window to drive open wheel cars. At 24 years of age I never really feel old until I am gridded next to a 16 year old! I never want to live with any regrets and I would be disappointed if I never fully pursued my dream of driving in IndyCar. The transition is a bit tough and it is taking me longer to adapt than I thought it would, but it is a fascinating challenge. I need to get used to the downforce of the car and just how quick it is to react. Once I build up my confidence in the high speed corners I think I will be right there. Nick's, er, "lively" off-track pursuits. I understand you have a somewhat unusual hobby. Care to tell us about it? NM: Haha which one? My friends have always thought I was a bit crazy as I skydive, spearfish, and practice Krav Maga, but I believe what you are referring to is my fascination with reptiles. It started out when I was a kid and I caught a snake that my mom let me keep. I became very intrigued with reptiles and all of the misconceptions about them. I began taking classes at a local nature center and then eventually started teaching there. I have kept and bred snakes at home since I was about 7 years old (my collection was over 40 snakes at one point!) and also started catching and photographing them in the wild. 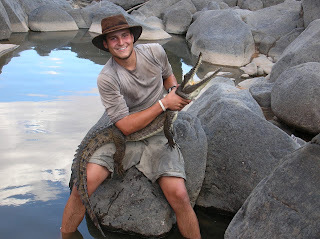 My interest has taken me on trips all over the world now: I have caught crocodiles in Australia, vipers in Costa Rica, and anacondas in Ecuador to name a few. It's just like the racing in that the more you know about it the less crazy it seems! Where would you like to see yourself in racing, ideally or realistically, one year from this date? NM: Ideally: Star Mazda Champion. Realistically I'd like to have been a front runner in the Star Mazda races towards the end of the season when I figure the cars out. I'd like to be either returning to Star Mazda to fight for the 2012 championship or graduating up the Mazda Road to Indy to Indy Lights. I’m working on my season preview for next week (which, given the extreme silliness of this Silly Season, has proven difficult, as I’m not able to nail down the team rosters yet in some cases), so nothing big today. I did, however, want to make a brief comment on the field size for this year’s IZOD IndyCar season. A few years ago, this series was scrapping for 17, 18 drivers. Now, we are on track to have approximately 26 cars line up at the Streets of St. Petersburg. Now, a couple of those 26 are likely backmarkers, but there are far more drivers capable of winning or giving it a good fight out there. There’s also going to be a healthy rookie class, a competitive American contingent, multiple returning champions, and a brand-new team making their debut in the field. Of course, there are drivers we all want to see still very much in limbo; we’re waiting to see what situations materialize at Coyne, Conquest, the rest of the season for AFS, and potentially others. But even if only 1 or 2 of the veterans now on the sideline make it into this series, we’re still looking at the deepest, most talented field we’ve seen in several years. No one is suggesting things are optimal in IndyCar; like many of us personally in a rough economy, the series has a long fight ahead of it. But progress is not a neat thing; it’s sloppy and uneven. We’ve got ourselves a race season officially starting next week, and IndyCar is on the way up. With the open test at Barber Motorsports Park wrapped up, here are a few thoughts on some of the proceedings and on-track happenings. -Newman/Haas Charges Ahead: The press, blogosphere, and social media networks all seemed quite impressed with James Hinchcliffe, who regularly posted impressive times near the top of the speed charts. Both Hinchcliffe and projected teammate Oriol Servia performed well for Newman/Haas Racing. Servia's going to be full-time; now, we wait to see how many races Hinchcliffe will get this year. -Red Cars, Red Cars: As expected, the Ganassi and Penske drivers dominated much of the proceedings, with Castroneves taking the fastest overall lap of the test and Will Power being close behind. Scott Dixon had the third-fastest lap. The new Ganassi lads, Charlie Kimball and Graham Rahal, both ran respectable times, but they aren't topping the charts just yet. Hinch had plenty to smile about. -Sweet Parity? : Six different teams posted Top 10 times. Marco Andretti and Ryan Hunter-Reay looked sharp for Andretti Autosport, and multiple drivers posted very similar times just outside the Top 10. Excluding Hildebrand's somewhat abortive test, there was a mere 2-second difference between the fastest individual driver fast lap and the slowest. Will Power will defend his road championship fiercely, but the competition on the twisties should be especially intense. -Sweet Home Alabama: Slightly lost in the scream of the on-track engines was the announcement the Grand Prix of Alabama should be a sellout this year. That's a pretty healthy sign for a region some of us weren't sure would embrace IndyCar. Let's wait until after this year's event, but I'd say things are looking positive in that regard. -Accidents Happen: J.R. Hildebrand can't be feeling all that hot after an incident on Day 1 of testing killed any hopes of testing on Day 2. Mike Conway also had an incident that stopped his test, but at least it was on Day 2 and not the first day. Conway showed some good stuff before the incident; Hildebrand and Panther didn't get a chance to show any faster times. They'll have to save it for St. Pete now. -Jakes Not Flakey: (Man, I miss that restaurant). James Jakes is still a relative unknown, but he did a respectable (if unspectacular) job improving his time over the course of the two-day event. No one is sure what the driver situation will be at Dale Coyne Racing, but Jakes appears to be in that mix. I think a lot of fans would like to see Alex Lloyd back in the #19, but that front's been pretty quiet. Take heart; nothing may be finalized at Coyne until the very last minute. RHR showed speed for Andretti. Nice paint, too. -Bourdais Back: Keeping it with Dale Coyne, it seemed a bit odd (but very neat) to see Sebastien Bourdais in an IndyCar once more. Sebas' times weren't exactly gangbusters, but I still think you cannot afford to underestimate this multi-time ChampCar champion. If there's speed to be had on a road course, Bourdais will find it. Now we just need to wait for Coyne and Sebas to make the deal official. -This Is Only A Test: As I've stated before, these lap times are no reason to panic, especially if your favorite team wasn't quite where you'd hoped to see them. Teams have a number of progressions and strategies in this test; what's going to be really interesting is seeing who's on pace when it comes to qualifying at St. Pete in just over a week. Damon Sturrock has worked with multiple teams in North American open wheel racing since 2001, but this year sees him as the Lead Mechanic for HVM Racing's #78 Nuclear Energy car, piloted by Simona de Silvestro. Before that the Canadian spent all of 2010 as Crew Chief for Alex Lloyd's #19 car at Dale Coyne Racing. Today, he's the next participant in our Six Quick Questions, as he talks about the job, HVM's chances in 2011, working with Simona, and life as part of an IndyCar crew. Read on! For a little background, how/when did you end up as the Lead Mechanic at HVM? What were your jobs before this one? DS: This is my second time at HVM Racing. I first worked here during the 2008 season with E.J. Viso. I returned at the beginning of this year to work with Simona de Silvestro. 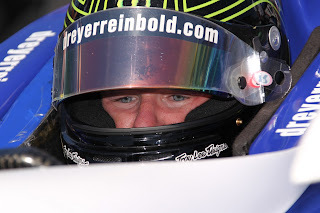 Last year (2010 season), I was the crew chief on Alex Lloyd’s car at Dale Coyne Racing. Living in Indianapolis and working in Chicago is very tough. I'd work in Chicago during the week and come home on weekends, but during racing season that can be hard to do. I really enjoyed myself the last time I worked at HVM Racing. So when a position opened up, I jumped at the opportunity to work with Simona while being able to stay home in Indy! We talk about the Indy 500 a lot from a driver’s point of view. What’s it like to be part of the crew during the Month of May, qualifying, and the race itself? DS: The month of May is pretty special. This year will be even more, I think. There is an incredible amount of work that goes into preparing for Indy. It's by far the biggest race all year, and along with that comes an amazing amount of pressure. Doing well at Indy can determine how the rest of your season goes. Working 14-hour days for three weeks in a row is taxing on anyone, but being quick on the track at the beginning of the month makes it a little easier. When you’re slow and trying it find speed, you work harder and longer, which is majorly stressful! I was on Ryan Hunter-Reay's car in 2009 when we barely made the show by being the last qualifier! It was possibly one of the worst experiences of my life because I couldn't imagine working that hard all month and not racing. It would be crushing. Race day though, is an amazing experience! It's long but incredible. We have to be at the track at 5 a.m. in order to do a bunch of last minute checks, go through all the race-morning traditions and then head out to grid. The grid is awesome! All the people and pre-race excitement is a huge rush, and helps you get pumped for pit stops during the race. After all… it IS the Indy 500! You had to know we were going to ask: What’s Simona de Silvestro been like to work with thus far? DS: Simona – or Sim as we call her – has been great. She is truly a pleasure to have around because she’s always in a great mood and smiling. She comes by the shop quite regularly to see what's going on and usually lifts everyone’s spirits! Simona is very positive, super dedicated and LOVES driving the race car. I think it going to be a fun year! HVM arranged for testing this winter at Texas, something I understand the team hasn’t done a lot of on ovals for a few years. How’d it go, and how do you see your team’s oval program shaping up for 2011? DS: I think the oval program this year is definitely going to be better than it has been in the past. Getting a chance to test in Texas was huge for the team. We learned a bunch of things and found some more speed, which can be hard to do with the little track time we see on race weekends. Sometimes you only get an hour of practice before qualifying so you need to have you stuff together. Hopefully we are a little better prepared now! Cars crash. How hard is it as a crew member to see something you worked so hard on be destroyed, and how do you deal with that? DS: Well... it happens. It's tough to see the car that you spent countless hours working be smashed to a millions pieces but it’s the reality of racing sometimes. The thing is that the cars are built to break apart in a crash to help save the driver. So after a big wreck, your first concern goes to whether or not the driver is okay. I worked on some cars that have been in huge wrecks. It's never fun but thankfully – for the most part – they have all recovered. You can’t ever really get upset with the driver unless they were just being careless. Let’s be honest – we are asking them to go out there and drive at 240 mph. Almost out of control. It’s our job as the crew to give them a car that doesn't let them down, and they usually bring it home. What aspect or element of competition in the IZOD IndyCar Series do you think fans sometimes fail to see or understand? DS: I think I’d have to say the off-season. One of the most frequent questions we get asked is, “So what do you do in the offseason?” Some of the fans think that when we’re not on track, we just get to go home and relax. In reality, there’s almost as much to be done in the off-season. From fixing parts that got wrecked on the track to shop improvements to testing – our work is never done. But I wouldn’t trade it for anything. Don't Panic: So your favorite team is a bit slower than some lower-tier team when the times come out? Don't worry, and remember this is testing. Teams are working on configurations, multiple technical issues, and a whole host of other things. A time slightly off the mark here could mean nothing, ultimately. At the same time, it'll be interesting to read between the lines and see how some of the teams are in terms of overall comfort level with their progression. 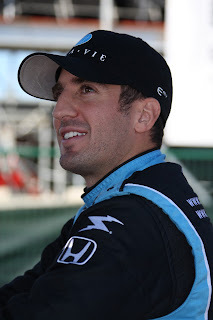 New Faces: J.R. Hildebrand (Panther Racing), Oriol Servia and James Hinchcliffe (Newman/Haas), Ana Beatriz (Dreyer and Reinbold), Sebas Bourdais (Dale Coyne Racing), and Charlie Kimball (Norvo Nordisk Ganassi) are all among those in new or different situations this year. The rookie class of Hinch, Hildebrand, and Bia should be especially intriguing to watch. (Think on this as well: for the IZOD IndyCar Series, I'm pretty sure Sebastien Bourdais is technically considered a rookie). TBA: Both the #19 Boy Scouts of America car for Dale Coyne and the #34 for Conquest Racing are still shown as TBA. The hour's late, but someone will be in those seats over the two-day test. Just who those drivers are should go a long way towards clearing up some of the lingering questions of the 2011 season. Kimball: How will the rookies compare? Expect Lots Of Announcements: Deals finalized, drivers announced, sponsorships revealed--there's going to be a media swarm during and immediately after this test. Remember, this is the week before the season starts. Most, though not all questions, should be answered within the next few days. Hopefully, questions such as the status of Hinchliffe's ride with Newman/Haas, confirmation on Kanaan's ride at KV (not currently listed as a driver for the test, incidentally), and hopefully a bit of news from any remaining teams or entrants hoping to join the fray should be forthcoming. Livery! : Those of us that love the different designs and tweaks to car liveries are going to be on cloud nine the next couple of days. As the cars roll off the transporters, eagle eyes will spy every adjustment, paint scheme change, and subtle alterations from the previous year. Above all, enjoy it, read up on it, and get yourself ready for racing. The test at Barber means we're almost to the starting line! I’ve always found that the roughest time of winter is right before spring. Sure, the snow and ice aren’t exactly pleasant, but you had become resigned to it, learned to work within the elements. No, without question the roughest time is right before spring. You hear birds in the morning, and some green begins to peek through the brown, bare spots of land and piles of leftover dirty snow. But the weather’s still miserable, with arctic winds that don’t seem to remember it’s “almost” spring. We expect it to magically turn into spring overnight, but it just doesn’t happen. Yet. IndyCar Silly Season is much the same way. Oh, I was a restless spirit in December, January, February, but I knew it was the offseason. I was desperate for IndyCar news, but could frame it within the expectations of that offseason. My poor wife, whom I fully expect will have a martyr’s statue of her outside of the IndyCar Spouse’s Support Group Headquarters one day, had to endure daily dissertation of Why Bertrand Baguette Should Return To IndyCar, or Why This Household Shall Support Simona De Silvestro So Long As I Am Head Of It. But we were hunkered in, knowing that the Streets of St. Petersburg would not come for months yet. And so we wrote, and posted, and speculated, and dreamt. Now, we are a few weeks away from spring. Teams are testing, at Texas, Sebring, Barber. The first race is finally just around the corner—just a couple more weeks!—away. But we don’t just want testing. We see other series racing. We want IndyCar—our cars, on the track, racing, now. We want the driver scenarios at all the teams decided and public. We want to see IndyCar on TV, check timing and scoring, see how all the questions we’ve asked in the months prior begin to be answered. But outside, it’s still winter. For a few weeks more. And so we become more anxious, more excited. Some of us bear it manfully, patiently, wise with a lifetime of racing seasons and offseasons. Others of us cannot do so, and rage mightily against anything in our path. Still others of us attempt to lead normal lives, but can barely contain our impatience for IndyCar to begin once more. It’s part of being a fan; the waiting, the anticipation, living and dying on every rumor and announcement that surfaces. Once, our fathers and grandfathers underwent the same ritual, ready to see Vuky, Sachs, Foyt, Sneva, Mears on the track once again. They waited for the scream of engines, and dreamt of a perfect prelude to May. Maybe it makes us irrational, maybe it even makes us insufferable to our loved ones now and again, but it is part of our being. Because we know, just as winter must give way to spring, the green flag will again soon wave. And the wait will have been completely and fully worth it. Slightly lost between yesterday’s closed IndyCar test at Sebring and the ruckus over the “Lucky Dog” (hey, it isn’t Green-White-Checkered, so I’m ok) news was the announcement that Josef Newgarden will be joining Sam Schmidt Motorsports for a full-season program in Firestone Indy Lights. Newgarden, at all of 20 years old, has already raced in Europe the last two years, most recently in GP3, where he showed marked improvement in the second half of the season. Before that, he was the first American to win at the famous Formula Ford Festival at Brands Hatch. 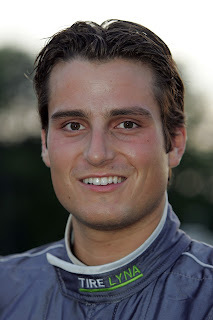 He racked up 11 wins in two separate series in 2009, and finished second overall in British Formula Ford for the year. Josef is a pretty well-regarded prospect, and I have a feeling we’ll see him get up to speed very quickly in Lights. I believe a lot of people felt like he was destined to drive in the various European series, so having an American prospect of his caliber return to Lights should be good news for the fans and for the series. We’ll have to see how he does, but Newgarden could be a star for IndyCar in a couple of years if he performs as well as I think he will. Indy Lights still has more drivers to be announced, most notably at Andretti Autosport (where it’s looking like Philip Major and Stefan Wilson), as well as AFS and Bryan Herta’s team. But between drivers such as Newgarden, Anders Krohn, and Esteban Guerrieri, I’m thinking we should have a pretty lively battle for the Indy Lights championship. 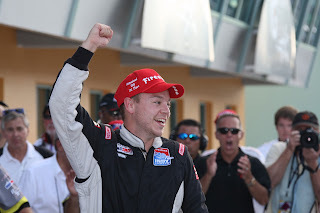 Brandon Wagner hasn't been around Indy Lights for very long, but the 23 year-old USAC veteran and Purdue grad already claimed his first victory at last year's season finale at Homestead, and is looking to move up the ladder in 2011. Despite only running a partial schedule in 2009-2010, Wagner already has a pole position to go along with his victory in Lights. A native Hoosier, Brandon was kind enough to participate in our latest round of Six Quick Questions. Read on to find out more about Brandon and his future plans. Hello, Brandon, and thanks in advance for visiting with us today. You won your first Firestone Indy Lights race at Homestead last year after only 13 races in that series. Do you see yourself as having improved over that span of races, or do you feel like things finally all just came together? BW: I feel like it was both factors that helped us win the Miami Homestead race. We always had a fast car last year but had some engine issues at the beginning of the year. The seat time I had in the 2009 season gave me a lot of confidence for the 2010 season. The team and I were able to grow together and show the series that we can win. I believe we can win many more races this season. How was your partnership with Kingdom Racing? What's it like working with a long-time racing veteran like Davey Hamilton? BW: The partnership with Kingdom Racing was only for the 2009 season. I still respect George Del Canto a lot and we remain good friends. Davey has helped me grow so much on and off the track. He's helped me transition over to the Lights car as well as helping me with the marketing side. There's no doubt that without his guidance, we would not have had our success. We work very well together and I look forward to continue working with him for a very long time. You're also attending Purdue University right now. How does that fit in with your racing career, and do you see a full-time racing program in your future anytime soon? BW: Taking classes and racing is definitely a challenge. However I do plan on finishing school and racing at the same time. It's just something I've become used too. I would love to be a full-time driver, we are working very hard to make that happen. As a driver, how do you deal with adversity on and off the track? What keeps you going when things aren't going your way? BW: Adversity can get the best of you on and off the track. It's how you deal with it that matters. When you have a bad day on track the worst thing to do is dwell on it. I try to learn from my mistakes then move on as soon as possible. It is good to show emotion, but keep your emotion in check. Having a supportive family like I do helps me to keep going. You raced in USAC at various levels for a number of years. What do you think of the current USAC/INDYCAR connection in the Mazda Road To Indy? BW: I think its about time they worked together again. A lot of the IRL great drivers were first USAC greats. With fans being able to relate more to the local short track drivers, the fan base will increase for both series. I feel like that is why NASCAR is so popular. Bryan Clauson will be a great example of that and I look forward to seeing BC on track. Your name has been kicked around here and there as possibly someone who might see a race or two in the IZOD Indy Car Series this year (as well as any races in Indy Lights). Any chance we see you at the Centennial Indy 500, for example? BW: Davey, my father, and myself are all working diligently to land an IndyCar ride for me. The Indianapolis 500 isn't completely out of the question yet but it looks more promising that I will be testing an IndyCar this summer with hopes of a few races this season. If not the 500 this year then next year we will be ready. It would be an awesome privilege to race the Centennial 500. I'm going to continue to work hard on and off the track to prove to everyone that an IndyCar is where I belong. I went to the Indianapolis Motor Speedway Museum yesterday, and discovered that plans are definitely underway in advance of the Indy 500 Centennial celebration. 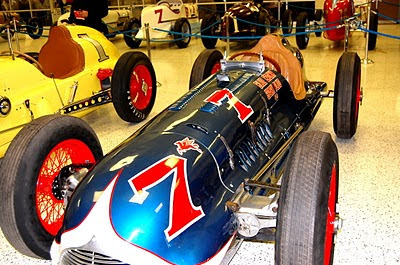 IMS had previously announced they would be moving out several displays to make room for every available Indy 500-winning car, and it appeared that's just what they were doing. Half the museum was roped off and almost half-empty, but you could see there had been a great deal of movement. Buddy Lazier's '96 winner was off in the corner, whereas Jack Brabham's 1961 Cooper Climax was next to a beautiful '27 Duesenberg. 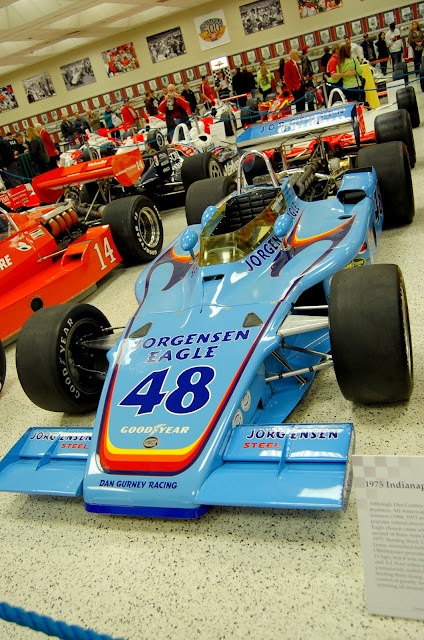 Bobby Unser's '75-winning Jorgenson Eagle sat nearby. There were still non-500 winners like these last two, but they're becoming few and far between. The NASCAR display and the motorcycles were likewise gone, along with several of the early examples of Hoosier auto company lines. If you're thinking of a trip out there right now, between the track tour, photo and gift shops, and cars that are actively on exhibit, there's still plenty to see, so don't worry on that account. The lady working the ticket counter said they hoped to have all the 500-winning cars done and moved in by next month, and I'll definitely have to come back for that. This is just another reminder that in this Centennial Indy 500 year, we can expect plenty of once-in-a-lifetime opportunities. And it's getting closer by the day. We all pretty much knew Firestone was likely finished in the IZOD IndyCar Series after 2011 or 2012, but I'm still sad to see them go. When your parent company is getting out of racing, there's not much you can do. Life will go on, we'll have new tire sponsors, but there's no denying Firestone has been a great partner with an amazing record of quality. One more time for the road, here's a couple of my favorite Firestone commercials. Thanks for the years together, Firestone, and I hope we see you back our way someday soon. Have a great weekend! With the news yesterday that Ana Beatriz has grabbed a full-time ride with Dreyer and Reinbold Racing, one of the remaining full-time seats for the upcoming season appears to be settled. That’s great news for Bia, but only throws the situations of drivers such as Dan Wheldon, Paul Tracy, and Tony Kanaan into murkier waters. For Wheldon, we believe he was offered a part-time gig at Dreyer and Reinbold, and said no thanks. He still seems confident of a full-time ride, but no one seems quite sure where that might be. After his performance in helping save our planet from alien invaders, you would think that would be a pretty good inducement for a team to hire him, but we will just have to wait and see. Paul Tracy is still linked to the seat at Conquest Racing, but it still doesn’t sound like that deal is 100% yet. As for Tony Kanaan, he’s the true cipher in all of this. If you name a team in IndyCar, there’s some theory or rumor linking him to it. Despite all of this, in the end all we can say right now we’re just not sure what will happen with TK. Yet. Still awaiting word on PT's ride. Perhaps the most prime remaining seat is the 3rd seat of KV Racing. Wheldon and Kanaan have both been mentioned for that seat, but there’s absolutely nothing firmed on either of those possibilities at this point, outside of Jimmy Vasser possibly having some fun on Twitter. Over at Newman/Haas, I really believed we were primed for an announcement on Oriol Servia, but it hasn’t happened yet. Soon, let's hope. Let’s not forget Alex Lloyd, Tomas Scheckter, Sebas Bourdais, Martin Plowman, James Hinchcliffe, Pippa Mann, Bertrand Baguette, Rafa Matos, and a few others who are still in the mix. And yes, we just might see Milka Duno once more at Dale Coyne. For seats, there’s possibly part-time work at Dreyer and Reinbold, Dale Coyne, HVM, Conquest, and a couple of others. The hour may seem late, but for IndyCar, this is nothing new. With many seats, it might be closer to or immediately after the March 14-15 open test at Barber before things are really firmed up. Honestly, though, this has been an insane silly season, and it isn’t close to being over yet. In the era of social media, everything's magnified, for good and for ill. In three weeks we'll be able to look back and see where things developed in completely different directions than anticipated. I have a feeling we’ll all be knocked on our butts (ideally in a good way!) at least one more time. One of my most very favorite people in all the world is the track historian for the Indianapolis Motor Speedway, Donald Davidson. Anyone who’s heard Donald’s Talk of Gasoline Alley radio show each May knows the man’s knowledge of the Indy 500 and the Speedway is encyclopedic, complete, and endlessly riveting. He will tell you of individuals who showed up to the track in 1940 and thought about getting in a car, but never actually did. He will tell you of the sponsors behind the sponsors on the 10th place finisher for the years 1950-1957, inclusive. He will tell you, because he is asked to every year like clockwork, the story of Jim Hurtubise swapping out his engine for a cooler of beer on Bump Day. If you somehow haven't listened to him, check it out, a) because it's the best thing you'll hear all day, and b) because otherwise what follows will make even less sense than usual. TSA Agent: Sir, have these bags been in your possession the whole time? DD: Sure, I’d be happy to do that one for you. This one on the left is a Samsonite, and I originally saw it in, well, it had to be 1968, because that was the year Dan Gurney had one just like it, and I believe Bud Tingelstad had one that many people mistook for the same model, only his was a deeper navy blue. It was named the Samsonite Roller Special, but it never turned a roller wheel at the track that year, because at the last minute I remembered I had borrowed an old front-strap Army haversack from Mel Kenyon, which worked out very well. Let’s see…now, I took it on vacation in 1969, and it did well for me that year. 1970 I was laid up with back pain, so it didn’t make the trip. 1971, I believe I chose it 2nd to a Brooks Carry-All, which of course eventually won Consumer Travel Product of the Year. It suffered a broken wheel in 1972, and its bad luck continued when the side zipper went out almost immediately in 1973.